Robot Betty9 is the life work of robotics expert Thomas Messerschmidt. She is now in her third incarnation and has just gotten a new head and new software. She performs at various Southern California venues. When Mr. Messerschmidt first saw Japanese robots singing, speaking and walking, he decided that these human-like beings could be built here in the USA and would be better than their Japanese "cousins". 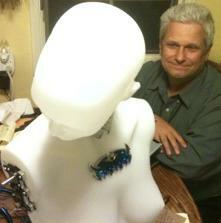 Work on Betty9, her name a homage to Betty Page and the lost in space "B9" robot, was begun in 2002. 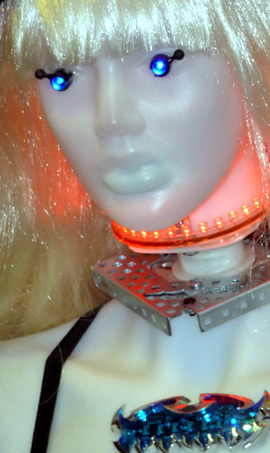 The roboticist purchased a fiberglass mannequin, cut it’s head off (gruesome, yes? ), and dismembered it’s arms and legs like a bad horror movie. He then added joints and high torque winshield wiper motors to her elbows, , a left and right turning motor to her neck, various lights (no robot is worth its diodes without flashing lights), and an antenna that was screwed into its head. He fashioned two LEDs for eyes, and a light behind the mouth for the appearance of speech, that was made to flash in sync with sound using a “color organ”. 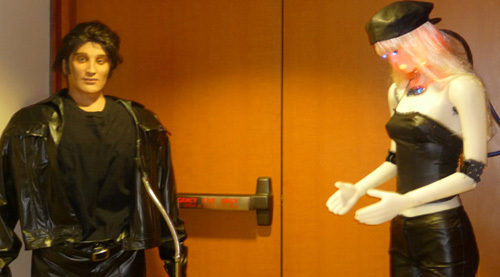 In 2008 he installed Leaf AI software so that Robot Betty9 would be able to verbally respond to questions using Microsoft's SAPI5.1 speech I/O. In 2009, wishing to animate all of the joints and have Robot Betty9 walk, he bought a plastic mannequin and remade her from the ground up. He again had to cut the head off and cut the arm and leg joints apart. The original mannequin had a head that was opaque yet allowed some light to show through. Thomas decided to go with a blue-tinted transparent head that he had found at a shop in Torrance, California. 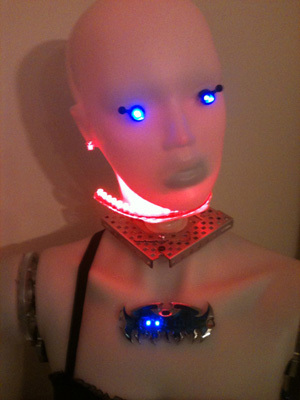 Again, with LEDs for eyes, and mouth, he fitted the head as before. He added power roller skates to allow the robot to move around. He articulated the shoulders and elbows and wrists. The neck was articulated using a Servo City pan and tilt servo mount and a couple of VEX servo motors. This allowed the head to turn left and right as well as up and down. The mechanism was rather stiff and looked rather rough, yet it worked as needed. It was in this incarnation controlled by a VEX microcontroller. 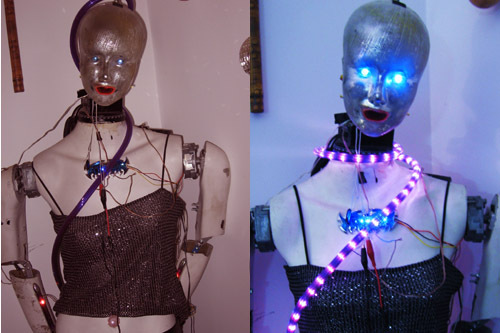 Betty9’s latest incarnation, finished in the Fall of 2010 unintentionally resembles the robots from the Bjork video "All is Full of Love." Still her voice, powered by AT&T voice and Vocaloid software, sounds nothing like the pop singer. Below are some photos of her. Click HERE to see Betty9 Singing!